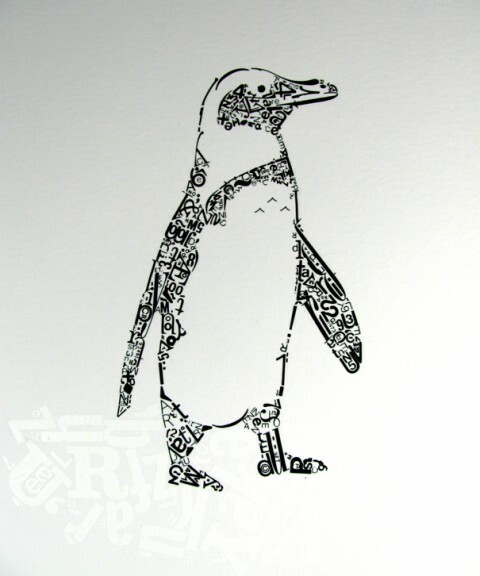 Marc Fischer and I share two things: Love for Penguins and Letraset. Now combine the two and you get an instant YAY from me. wow this is amazing, love at first sight! I did something similar for a class project. I did it digital though, and rather than an adorable penguin my creation is of Audrey Hepburn. I love it- I’d love to see a whole set of animal prints like this one! It also oddly reminded me of the line drawings of animals that Picasso did. My father was a designer, and he always had sheets of Letraset lying around in his office, and when I was younger I used to try and make words and sentences out of the letters that were left over. A few years ago when I was in my mid-twenties studying Graphic Design at Uni, I brought in some of these coveted Letraset sheets to share with the class and demonstrate how things had changed with the advent of computers etc. A vast majority of my classmates (who were only five or six years younger than me and straight out of high school) had never even heard of or seen Letraset! Maybe it helped having a parent who was a designer, exposing me to a pre-digital world of graphic design, but it amazed me that these were people who had chosen to study graphic design, and yet had no idea of the way things were done before computers. I also have a few Letraset catalogues that I treasure to this day, yes, I still have those Letraset sheets, and yes, they still work!!! You should have a look at: http://www.lewisesdale.com he is an artist from London, currently studying at Westminster. He has worked with Letraset in his new work. How very creative! I just came from the Ringling School of Art and Design looking for Letraset materials. I used it back in the late 70’s putting together employee publications that had to be camera ready. All those hours of tansferring letter by letter. I’ve been looking for some 10 – 12 pt. for some artwork I’m working on. Also, this is the first time I’ve ever left a blog – imagine that!